The work we do matters, and we deserve to be treated with dignity and respect. We need UPMC to work with us, and to create good jobs and help us make a stronger, healthier Pittsburgh. 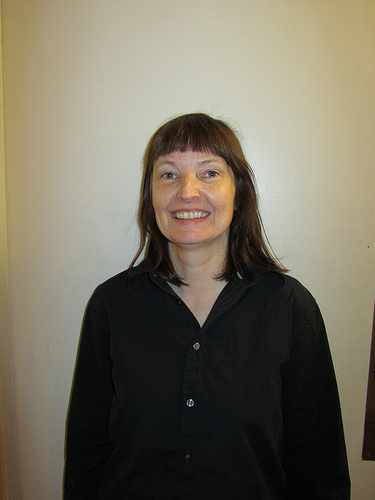 My Name is Mary Hughes, and I am a UPMC employee. My coworkers and I are calling on UPMC to create good jobs for a strong and healthy Pittsburgh. Will you join us and sign our online petition? I have worked as a medical transcriptionist in the imaging department for the past 8 years. People sometimes think that transcriptionists just copy out what the doctors say, and ask “where’s the skill in that?” But the truth is we have to know a LOT about medicine to get he notes right. Every day we catch the little human errors that doctors make, and it’s our job to call them up and ask if we should make a correction. That’s the role we play in keeping patients safe and healthy. I am very proud of the work I do. But my work is not all of me. I am not an expendable person who can be worked until the end of their life without any life for themselves. Nobody is expendable and it is wrong when employers treat people as if they are. It’s good advice, but it’s not enough. My mother is old now, worn out, frail and sick. Her time is almost gone. When I hear her coughing in her bed at night, trying to clear the fluid her weakened heart can no longer cope with, I wish her life had something in it other than hard work. I wish she had enjoyed some of the richness that the people she worked for enjoyed. I wish she had not been used up to the point that she could no longer give. At UPMC, the people around me are getting used up. They work hard – too hard – since everybody puts in overtime to make their paychecks bigger. And even with all that, many rely on foodbanks and other forms of assistance to feed themselves and their families. It feels as if nobody is making enough to live, let alone to start to see work pay off. 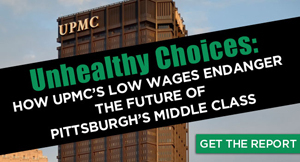 And at UPMC, even workers who make a good living can’t count on it. 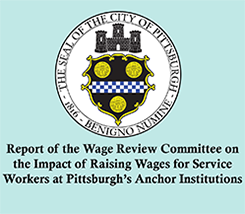 This year hundreds of skilled UPMC transcriptionists were plunged into poverty when UPMC sold them to Nuance, a company that pays so little for a line of transcription that it had to supplement one of my former colleague’s paycheck to reach minimum. Many of these workers had served UPMC for 20 and 30 years. They are still transcribing for UPMC hospitals, but their lives have been devastated. Here’s the worst thing: even as people work themselves sick, or fall into medical debt with their very employer, or fear sudden financial ruin, UPMC makes it very clear that to speak out or try to get make changes is not tolerated. UPMC’s workplaces are places of fear. UPMC is using all of its wealth and power to silence workers who are trying to make their lives better. To know for sure that their kids won’t go hungry at some time during the month. To be able to get the care they need in the hospital that they clean. You have my full support and we will continue to fight a fight worth fighting for…EQUALITY & JUSTICE! Whether it is medical, clerical, human resources – if you are hiring someone onto your team, they should be rewarded with good pay and benefits to create a healthy lifestyle. People at the top need to realize that it is people at the bottom that make your lifestyle possible. It takes a team and all should share in the benefit. You have my support for basic human rights in the workplace. THIS CAN NOT GO ON, WE THE PEOPLE MAKE UPMC. On a daily basis, UPMC forces members of its Imaging department at Presbyterian to “Flex-out”. This means that if they feel that they need to cut payroll or the schedule is light, that they send you home halfway through your shift, without pay. It has been months since I have received a 40 hour paycheck. It is very difficult to save for a home, a wedding, braces for my sons teeth. Plain and simple, after working for UPMC for 7 years, I realize that everyone is expendable to them, you do not feel pride but fear of losing your job working for them. Everyone from the Physician Assistants to the Transporters are underpaid. In my department, my pay after 7 years still ranks in the LOWEST 5% of the united states for my field, even though I do more complex and multiple tasks at an ever hastening rate. This year we were told that we get a 2% raise MAX. That amounts to 30-50 cents for most people. On top of that, they have increased all of our health copays, while raising the cost at the same time.The middle class is slowly slipping away from many in Radiology at Presbyterian. We signed up to work for a non-profit, but in the end the only one not profiting from this partnership is us! People…. it’s time to make a stand and earn what we deserve. Don’t let fear drive you into submission any longer. Together, we could be stronger than UPMC…. but stay fragmented, and they will always win.